Please refer to the map attached above, the location of New Zealand is at the bottom-right hand side, circled. New Zealand, is a paradize of all either part-time or professional photographer, the amazing landscape can really attract many many of us. I ever traveled to New Zealand and also ever have a thought that to stay there permanently to enjoy my rest of the life. 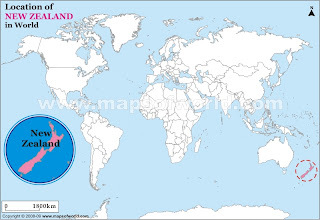 New Zealand, has great location situated at the south part of our round "Water Planet". New Zealand is independent islands in the South Pacific, with two main islands called The North Island and The South Island. Population of New Zealand is almost 4 million, a diverse cultural heritage and a rich, and quite a numbers of spectacular scenery. 24 hours, London to Auckland. 12 hours, Los Angeles to Auckland. 3 hours, Sydney to Auckland. Summer is a peak season for holiday. Hey there, just wanna let you know that u have got a wrong fact about new zealans. Wellington is on the north island, not the south.